AMD’s last generation of APUs fell behind when it came to power consumption, and the move to Piledriver has addressed some of these issues. The A10-5800K’s 30W idle draw isn’t much different from the 31W draw of last year’s A8-3870K or the 33W draw of the Core i3-3240, but the peak power draw of 131W is reduced from the 150W we recorded from last year’s top APU, even if it can’t match the 87W top draw of the Core i3. The A8-5600K isn’t much different, with idle and peak power levels of 27W and 126W. We’re pleased to see that neither chip gets too hot: the A8-5600K served up a top temperature of 57X, with the A10-5800K coming in three degrees hotter. They’re similar figures to the Core i3 parts, and they’re nothing to worry about. Even AMD’s stock cooler will easily be able to cope, and there’s enough headroom to cope with the extra heat generated by overclocking. AMD has set out to take down Intel’s Core i3 with its latest Trinity chips, and that means pricing is extremely competitive. The two A10-branded chips, the 5800K and 5700, come in at $160, and the A8-5600K and A8-5500K tip the scales at $128 each. The weakest chip in the new range, the A4-5300, costs just $67, with the middling A6-series part weighing in at $88. Both A8 and A10 chips, then, compare extremely favorably to Intel’ s Core i3 parts: the Ivy Bridge-based i3-3225 costs $170, and the older Sandy Bridge parts are little cheaper - the Core i3-2100, for instance, costs $144. AMD’s lesser Trinity parts will prove slower both in applications and games but, crucially, the price could be right for those building a system within extreme price constraints. On the surface, Trinity’s value is hampered by the need for a new motherboard, especially if you’re looking to upgrade a machine rather than starting a build from scratch. However, cash is saved when compared with Intel builds by the lack of need for a discrete graphics cards. And, with AMD intending to fill the channel with its latest parts, it shouldn’t be difficult to find pre-built systems boasting the latest Trinity APUs. With sensible upgrades and improvements on last year’s models, there’s plenty to like about the Trinity range. AMD hasn’t lost any ground when it comes to application performance against Intel’s Core i3s and, while Trinity is still a little slower, it’s not a drastic gap; if you can run applications on Intel, you’ll be able to run them on an APU. 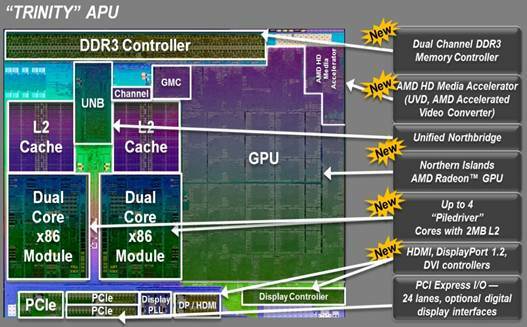 AMD has long intended for its APUs to make big gains in gaming, and that’s true here. The inclusion of a Radeon graphics core inside each chip make them far better than Intel’s own equivalent offering - twice as good, in some cases, as Intel’s top integrated graphics cores. This means that most games will run smoothly on an APU, albeit with lower quality settings, and it means that most people won’t need to bother with a discrete graphics card at all. AMD’s updated architectures improve power efficiency and thermal results, too, which puts paid to one of the only downsides of the firm’s older APUs. Quicker, more efficient and with great value, these chips are a steady improvement on last year’s model. Gigabyte’s debut FM2 board uses the ATX form factor, so it’s larger than its rival from Asus. While it won’t fit inside many of the smaller cases that are becoming increasingly popular, it serves up a broader range of features than the Asus. The selection of slots, for instance, is wider: it’s got three PCI Express x16 slots rather than two, a trio of PCI Express x1 sockets, and a PCI slot ideal for legacy hardware. It’s ready to use with more than one discrete graphics card, too, as the top two PCI Express x16 slots run at 8x speed. The inclusion of AMD’s new A58X chipset means there’s nothing but SATA 6Gbps ports on this board, too, with seven included alongside eSATA on the rear. The backplate is well-stocked with four USB 3 sockets and D-SUB, DVI-D, HDMI and DisplayPort outputs, and the price is right too: if you’re after an ATX board rather than anything smaller for your new APU, this is a fine choice.